Single-molecule techniques have rapidly developed as powerful tools for the analysis of structure and function of complex biomolecular processes. Particularly single-molecule Förster resonance energy transfer (smFRET) became a popular technique reporting on molecular distances and conformational changes of biomolecules. A smFRET experiment probes the energy transfer efficiency between a single donor–acceptor fluorophore pair within a distance of 2 to 8nm, while being blind to distances above 10nm. Nonetheless, numerous biological processes rely on large and extended multi-component complexes exceeding the length scales accessible by smFRET experiments. 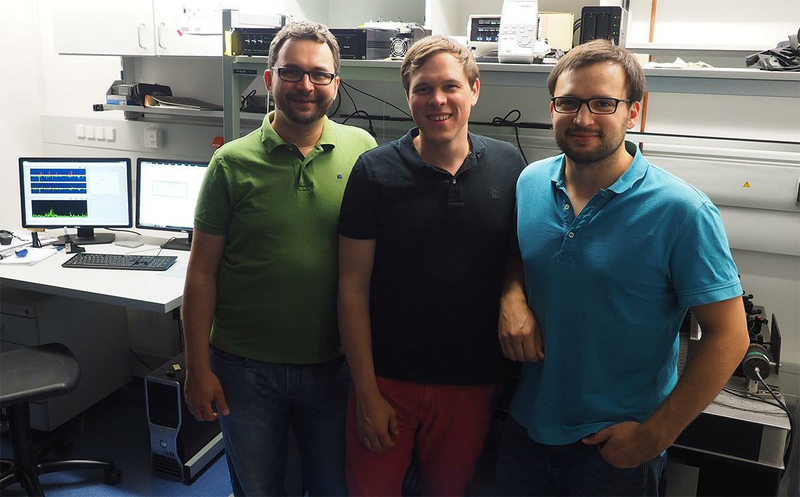 The team of former CPLC member Michael Schlierf and his students Georg Krainer and Andreas Hartmann overcame this limitation with the development of farFRET. A recent report in Nano Letters (1), describes the development of farFRET and demonstrates that farFRET can be readily employed to quantify FRET efficiencies and conformational dynamics using DNA rulers, RecA-filament formation on single-stranded DNA and Holliday junction dynamics. farFRET allows quantitative measurements of large biomolecular complexes and nanostructures, thus, bridging the remaining gap to superresolution microscopy.